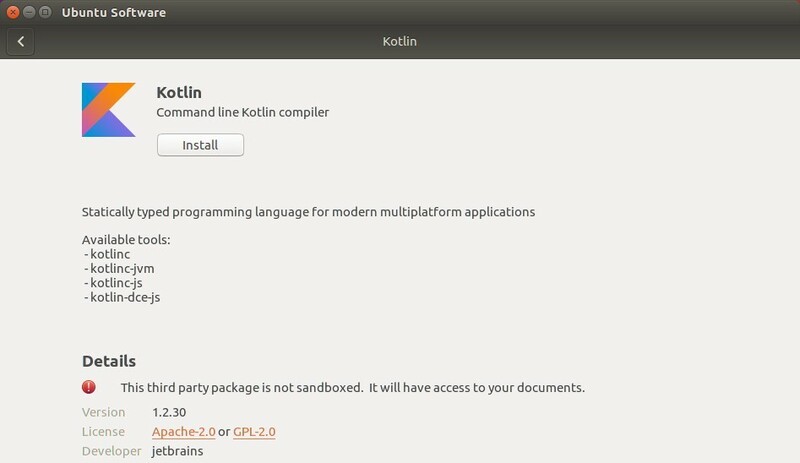 This quick tutorial is going to show you how to install the command line Kotlin compiler in Ubuntu 16.04, Ubuntu 17.10, Ubuntu 18.04. Kotlin is a fully supported programming language by Google on the Android, and is directly included in the Android Studio 3.0 IDE package as an alternative to the standard Java compiler. Kotlin is available as snap, the universal Linux package format, so it can be easily installed via following steps in Ubuntu. 1. (only for Ubuntu 16.04) Install the snapd daemon for those never installed a snap package. Input your password (no visual feedback while typing due to security reason) when it prompts and hit Enter. 2. Then open Ubuntu Software, search for and install Kotlin.